LAFAYETTE, La. – LHC Group, a Lafayette-based national provider of post-acute care services, has honored Natalie McCauley, regional operations director for Alabama and Florida, as the company’s 2014 national Servant Leader of the Year. She was selected from a group of 10 finalists as the national winner. The Servant Leader of the Year is the highest honor an LHC Group employee can receive. 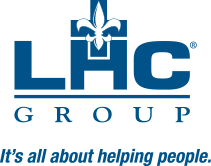 LHC Group is a national healthcare company with 10,000 employees operating more than 300 locations in 29 states. McCauley joined LHC Group as an executive director in 2012. She has worked in health care since she began a job at a nursing home at the age of 17. She eventually went to nursing school and spent time working in home health as a clinician in the field. LHC Group presents the Servant Leader of the Year award annually to a leader whose performance demonstrates the company’s core values and produces positive results. Keith Myers, LHC Group chairman and CEO, and Don Stelly, president and COO, presented McCauley with the award and congratulated her and her team for their success. “Natalie McCauley and her fellow Servant Leader of the Year finalists represent the best performers in our company,” Stelly said. “We are proud to have each one of them on our team, and thrilled that they will be there to lead us as we continue our mission to provide high-quality health care.